Tottenham and Manchester City will face each other in an all-English quarter-final of the Champions League next month, report agencies. Only two other English teams, Liverpool in 2005 and Manchester United in 2008, have been crowned European champions this century. Manchester City won both of their Premier League ties with Tottenham last season and also beat Mauricio Pochettino’s side at Wembley earlier in this campaign. Manchester United’s tie against Barcelona means interim manager Ole Gunnar Solskjaer will enjoy another trip to the Nou Camp, where he scored the winner in United’s Champions League final win over Bayern Munich in 1999. 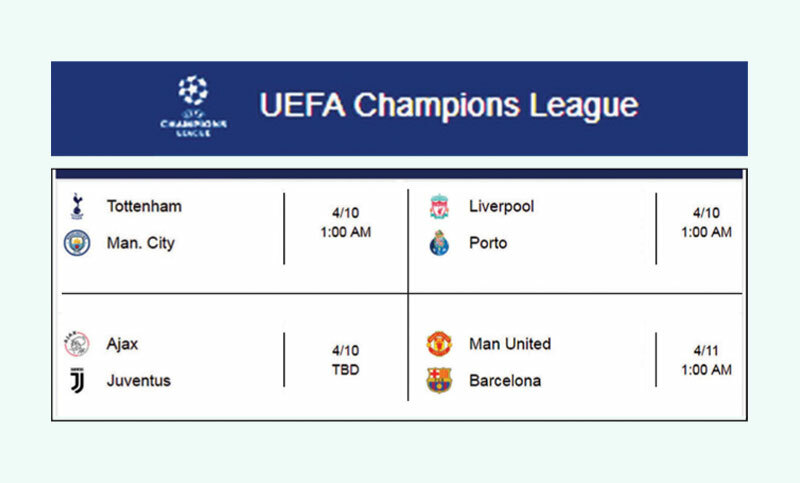 They were drawn to play the second leg at home, Manchester United will actually instead be at Old Trafford for the first leg against Barcelona. This is because City are playing their second leg against Spurs at home, and Uefa rules say you can’t have two sides from the same city playing home matches in the same week.